Cafe Eclectic, Memphis TN – Marie, Let's Eat! Marie’s sister moved up to Memphis ages back to attend Rhodes College and decided to make the city her home. Honestly, I wasn’t entirely sold on the place, but there’s still a lot to like about it, particularly the people. We might have found the urban decay in the city center and the areas south of town quite disagreeable, but everywhere we went, we saw people really enjoying themselves, and restaurant workers who seemed to truly like their jobs. The staff at Cafe Eclectic might have been the most vibrant bunch of the lot. We only got to see it as a breakfast joint, but it is open well into the night, providing a kicked-back place to hear live music and drink from their soda fountain. Honestly, if the restaurant’s lunches and suppers are half as good as their breakfasts, then this is surely one of the city’s best restaurants, and I say that despite being a little disappointed in my own meal! I had the porridge, because I’ve never had porridge before. I can’t swear that I’ve ever even seen porridge on a menu before, but then again, I don’t eat breakfast out as often as you might think from reading this blog. Maybe the old Bluebird Cafe in Athens served it. Anyway, it took several spoonfuls of brown sugar to make my porridge edible, and did nothing to dissuade me from thinking that between Goldilocks and the Three Bears, you had four people with nothing better to eat. Naturally, everybody else had much better food. 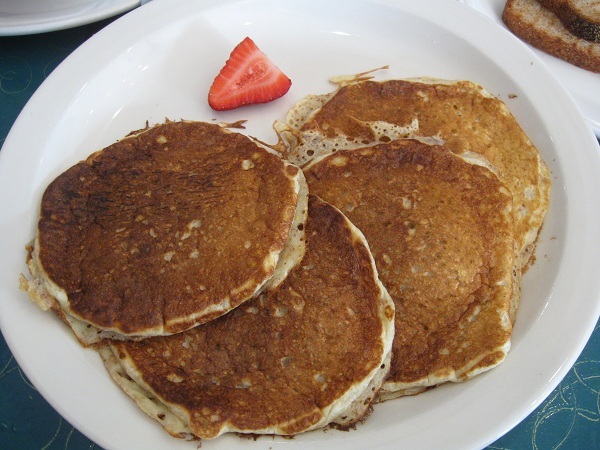 Marie had the buckwheat pancakes, and said that they were every bit as good as, but quite different from, the ones at Nashville’s Pancake Pantry. They were lighter, fluffier, and not as strong. Perhaps they were a blend of buckwheat and wheat flour? I suspect that the greatest treasures are the baked goods in the glass case up front. I had a chocolate cake doughnut which was not at all bad, but unfortunately I chose to eat it after I had finished one of their strawberry doughnuts. Oh, man. That might have been the best doughnut ever baked. Marie and I would like to try the giant puffy croissants from the glass case next time. They look buttery and altogether delightful. The scones also looked very tempting to Marie. 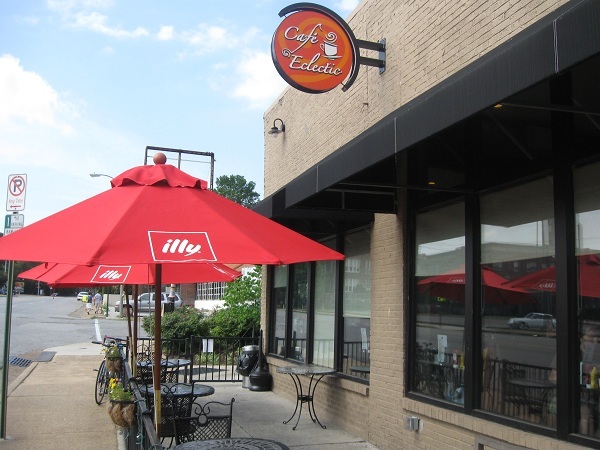 Cafe Eclectic is located on McLean Boulevard, just a short walk north of Overton Park and the city’s zoo and, happily for my sister-in-law, also a short walk from her house. The parking’s a little limited, and we got some hilarious gesticulations from a neighbor as we slowed to a possible stop in front of his house. Perhaps the next time we visit Memphis, it won’t be in hundred degree weather and we can just enjoy a nice walk from her place. Posted on June 21, 2010 July 29, 2017 by Grant G.Posted in breakfast, memphis, tennesseeTagged breakfast, memphis, tennessee. Pingback: Saigon Le, Memphis TN – Marie, Let's Eat!